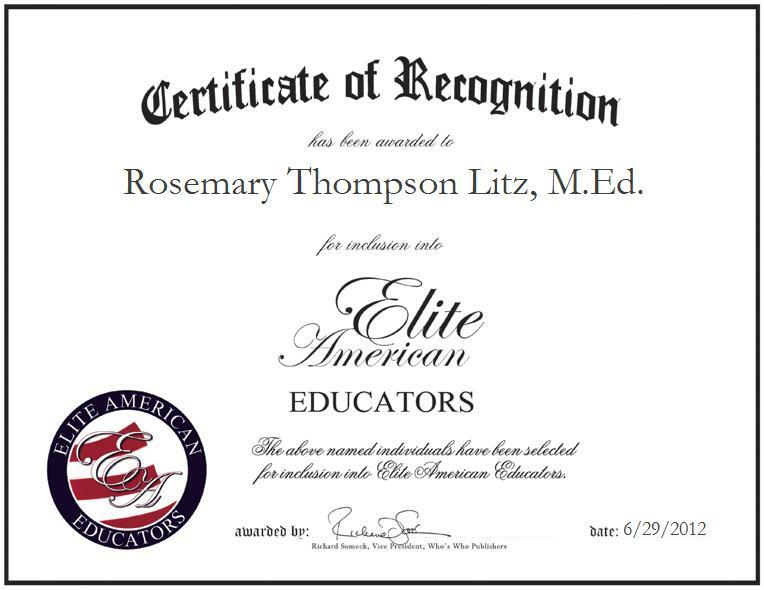 LANCASTER, PA, June 29, 2012, Rosemary Thompson Litz, M.Ed., former Reading Specialist for the Lampeter-Strasburg School District, has been recognized by Elite American Educators for dedication, achievements, and leadership in literacy performance. Prior to her retirement, Ms. Thompson Litz taught reading and assisted children in the achievement of their academic goals in her capacity as a reading specialist. Over the course of an illustrious career, Ms. Thompson Litz has amassed more than 42 years of professional experience, and garnered a reputation of distinction among those that she has taught and worked with in efforts to serve as an agent of positive change in her educational community. She was prompted to become an educator by a long-standing desire to teach and help others. Ms. Thompson Litz received a Bachelor of Science in Elementary Education from Millersville University. She went on to earn a Master’s Degree in Reading Specialist Supervision, plus 60 graduate credits from Millersville University. Ms. Thompson Litz has since remained abreast of trends and developments in her field as the president of the Silver Threads of Lancaster County, and as a member of Phi Delta Kappa. She is also on the Alumni Planning Committee of Millersville University, and she is a member of the International Reading Association. She is a former board member of the Pennsylvania State Education Association, and she is chair of the Social Services of Pennsylvania Association of School Retirees of Lancaster County Region 4. After having accomplished many professional goals, Ms. Thompson Litz pinpoints a major career highlight as her earning the special service award from Millersville University. Her dedication and the support she has received from her students and colleagues over the years have allowed her to shine as a luminary in her field. She is proud to have helped her students to become successful in their own careers, as well. Over her career, she has taught over 15,000 students, with all the responsibilities that go along with that. Contact Rosemary Thompson Litz, M.Ed.